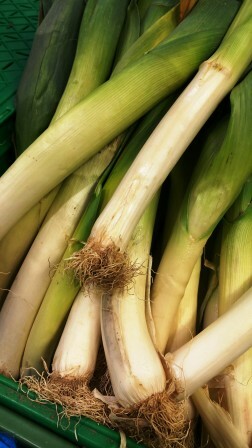 2 pounds small leeks, green tops discarded, white parts halved lengthwise, washed well and tied with kitchen string into 3 bundles. 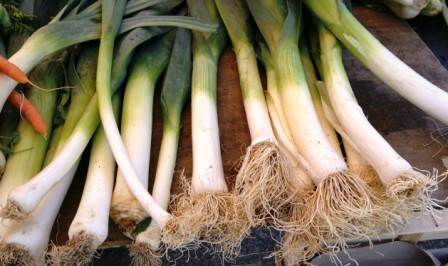 (I could not find small leeks, but the large ones were fine). 2 teaspoons cornstarch dissolved in 2 tablespoons water. In a deep skillet bring to boil enough cold water to just cover leeks, add leeks and simmer, covered, for 12 to 15 minutes or until tender. Transfer leeks to a colander, remove strings, and let leeks drain, pressing out excess liquid gently. In a small skillet combine Roquefort and cream, bring to a boil, whisking mix until smooth. Stir the cornstarch mixture, add to the Roquefort mixture, whisking, and bring sauce to a boil, whisking. (sauce should be the consistency of bechamel.) Arrange leeks in one layer in a gratin dish just large enough to hold them, and broil mixture under preheated broiler about 4 inches from the heat for 3 minutes, or until top in golden. The restaurant La Venta, Placa Dr. Andreu near the funicular Tibidabo, is still in business. Trip Advisor reviews give it high marks for both food and views from its terrace. I will try it next visit to Barcelona.